Is a dental treatment always painful? Any type of dental treatment and oral surgery, even placing an implant can be performed completely painless, by using adequate and appropriate amount of anesthesia. During a root canal treatment for a very inflammated three -rooted tooth the patient may feel some pain, but this is not common. In our clinic all treatments happen with anesthetic injection, and if necessary we give more injections or potent substances. When should I visit the dentist, only when I am in pain? A dental examination in most cases does not hurt at all, unless the area examined is very close to the nerve. If you have tooth pain a canal treatment is the solution and in the rare case that does not help then the tooth must be removed. Does teeth whitening ruin the enamel? Modern dental whitening products (not what you see on TV advertisements) in compliance with the operating instructions are completely harmless to the tooth enamel. The treatment followed removes totally the deposited pigment material that the food, drinks (tea, coffee, cola), tobacco cause, leaving you crystal white teeth. The tooth whitening treatment may last some weeks, depending on how bad the pigments are. The optimal treatment lasts no more than 10-17 nights. Most advanced whitening products already contain fluoride for protection and less sensitivity. The effect of the bleaching treatment is maintained for many years and if needed it can be repeated years later without any risk. Is implantation surgery painful and what makes it successful? The implants which are used nowadays are made of 100% pure titanium and enables the bone tissue to grow. It is allergy free and it gives an estimated 98 % successful result. An implant loss may be caused by an improper insertion (placing it in a wrong direction), or by an improper amount and quality of bone, or bone grafting overload, or may be too early to load the implant (not waiting for the ossification period 3-6 month). An even more common reason to lose an implant is the patient's inadequate oral hygiene. Gingivitis, plaque and calculus may develop causing bacteria in the gingival junction and the implant and get into the bone surrounding the implant. There inflammation develops, the bone begins to be absorbed, and the implant becomes loose thus must be removed. In normal loading and impeccable oral hygiene practice an implant remains successfully in its place. The implant surgery, with the proper anesthesia, is completely painless. There is no or very minor post-operative pain in most cases. A modern surgical technique theoretical knowledge equipment possession, is relatively relevant of any dental surgery is routinely performed. In our clinic the implantation surgery is carried out entirely under aseptic conditions, in order to minimize the infection. After surgery, antibiotic therapy is employed for the same reason. The ossification process is regularly checked by (x-rays). Missing ONE or TWO tooth can be replaced? Does it worth it? When multiple teeth are lost, with or without a prosthesis to replace them, significant loss of jaw bone can take place. This sometimes leads to difficulty wearing a removable denture due to lack of an adequate "ridge" upon which the denture can obtain stability. In the so-called "esthetic zone" of the mouth, where loss of ridge volume can be visibly apparent to the naked eye, this can lead to a cosmetic defect. 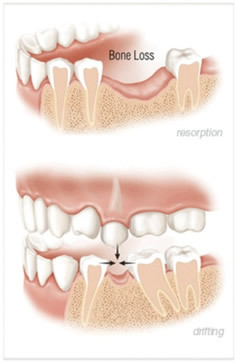 As the bone resorbs, the gum which covers it also shrinks away, creating a concavity (depression in height and width) that can be unsightly as well as possibly promote food impaction under adjacent teeth. In general, our teeth have a constant tendency to move both towards the front of our mouths and towards the opposing jaw, unless they are stopped by something in their way, usually the adjacent or opposing teeth. Loss of teeth allows this to proceed in a pathologic way. As teeth drift, they create discrepancies in the height and contours of the gum tissue that predispose adjacent teeth to periodontal disease progression and/or dental decay from accumulation of food and plaque and difficulty in cleaning these areas from "piled-up" gum tissue. Drifting teeth can also adversely affect the occlusion (bite), as well as cosmetics of your face and smile. We at Crystal dental clinic, recommend that every missing tooth has to be replaced within half a year after losing or missing it.